During your 7 days stay you will spend 5 days with an instructor who will show you how to find your balance on the board and how to catch the waves. Our professional surf instructors will split the group into 2 levels from beginners to intermediate surfers. Therefore each of you will get the best support during your surf lessons. We start our surf day with a tasty breakfast of fresh fruits, omelettes, Moroccan peanut butter and pancakes, which from a traditional family recipe. We leave the Surf Camp at 09:00 (tides dependent) to take you to the most suitable surf spot for your level. Because the surf conditions vary from day to day, our surf instructors will choose an appropriate surf spot every morning. A final decision will be made last minute using the surf forecast and a surf spot check. 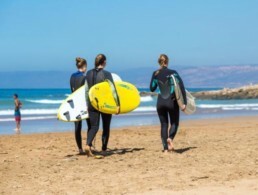 Surf lessons will only be taught at surf breaks that are suitable for beginners and intermediate surfers. During the first surf session, our instructors will explain surf theory and join you in the water of a 2-hour surf lesson. Once the morning lesson is finished, we head back to the beach to fill up with new energy with a fresh handmade lunch and choice of fresh fruit. Now you are ready for the guided freesurf session for the afternoon. During this session, your surf instructor analyses your moves and gives feedback for areas to work on the next day. We then head back to the surf camp at the end of the afternoon. You can then take an optional Yoga session at the sunset (also possible on the sunrise) or enjoy free time to relax in one of our terraces. At about 20:00, a traditional dinner made by our chef Karima Habiballah is waiting on the rooftop and contemplates a perfect surf day at Pro Surf Morocco.